This Unique Beltless Conveyor transports pieces of scrap, or parts, with a shaking motion. A custom tray is fitted onto the body and the rhythmic, linear motion moves the tray slowly forward and then quickly backwards. The metal shavings, scrap, or finished parts are gently shuffled along the tray and into a convenient container. Air consumption is so low that it is considered insignificant in a press shop environment. The noise level is well under acceptable standards for industrial uses. . Note 4: Maximum include of tray - 8 Degrees. Design a Custom Tray configuration to suit your application. 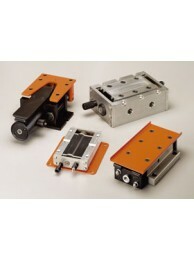 Visit www.thechuter.com for custom chuter system pricing. The TP-3 transports pieces of scrap, or parts, with a shaking motion. A custom tray is fitted onto t.. The TP-10 transports pieces of scrap, or parts, with a shaking motion. A custom tray is fitted onto .. 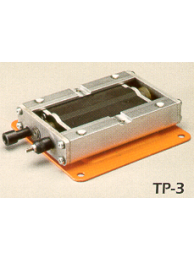 The TP-40 transports pieces of scrap, or parts, with a shaking motion. A custom tray is fitted onto .. The TP-70 transports pieces of scrap, or parts, with a shaking motion. A custom tray is fitted onto .. 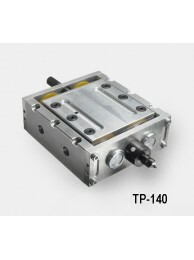 The TP-140 transports pieces of scrap, or parts, with a shaking motion. A custom tray is fitted onto..